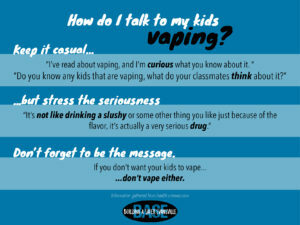 What Do You Need to Know About Vaping? 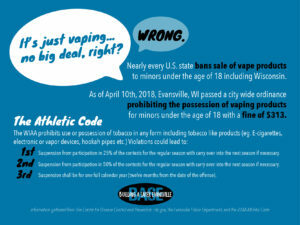 | Building A Safer Evansville, Inc.
What Do You Need to Know About Vaping? 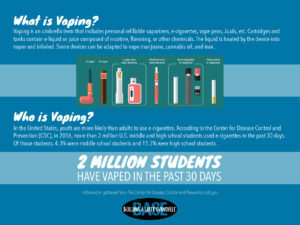 Vape pens and e-cigarettes have been in existence for just about a decade and there is little scientific research available as to the long term effects. Strategic marketing and advertising is targeted at youth. E-juice is available in thousands of candy, fruit, and dessert flavors that are attractive to young consumers. A big misconception is that since e-cigarettes and other vaping products may be slightly less harmful than traditional cigarettes, then they must be safe all around. However, that is not the case. Most e-juices contain nicotine and other harmful substances. 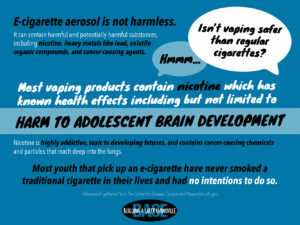 Vaping still poses a threat to the development of the adolescent brain. Health risks aren’t the only consequence of vaping.